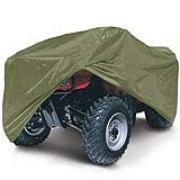 Summer is over, so now is a great time to cover up your ATVs with a good waterproof tarp. Even the best all terrain vehicle is not waterproof. The best place for it when rain, snow, or hail is falling is indoors. When that is not possible, tarps for ATVs provide alternative means of protection. People use ATVs for many purposes. Some of them are mostly for work. Others are for fun. For whatever reason, they provide access to rugged country that is beyond the capability of even a four wheel drive SUV or pickup. Almost any tarp can provide some protection, but one that is specifically designed for use with ATVs has many advantages. An ATV tarp is designed to be the right size and to be easily and securely attached to its vehicle. It should fit over the vehicle like a fitted sheet goes on a bed. It should come with a storage bag for greater ease of use. Even if the weather is good, a tarp can keep an ATV from getting dirty, reducing the need to clean it. If it is parked in a busy area, it may also benefit from scratch protection. The tarp can be color matched if this is desirable. A camouflage one may even be used for concealment, if appropriate vegetation is available. Ideally the cover should be in place whenever the vehicle is not in use. This may not be convenient if it is used many times during the day. At a minimum it should be in place during inclement weather, and probably at night as well. The ATV is an essential tool for many residents of rural areas. As with any tool, it will function better and for a longer time if well cared for. Providing shelter from the weather and dust is an important element of care. Tarps for ATVs provide a portable, convenient means for doing this. Make sure you use bungee cords to tie the tarp tight around your ATV so water does not catch and create puncture holes. Trying to get a poly tarp that is at least a 10 x 10 mesh count. This will assure the tarp is thick enough to make sure that water will not go through it. Get a plastic tarp with grommets at least every 18 inches. This will assure the tarp is securely fastened to the vehicle. If you're storing your ATV outside and covering with the tarp make sure your tarp is UV treated to survive, rain and harsh sun.